2020 GMC Sierra Denali 2500HD and AT4 2500 HD in San Diego. Under the hood of the new Sierra 2500HD is a familiar, but thoroughly updated, Duramax 6.6L turbodiesel V-8 making an SAE-certified 445 hp and 910 lb.-ft. of torque. SAN DIEGO – General Motors unveils the redesigned ’20 GMC Sierra 2500 Heavy Duty, a brawny body-on-frame pickup truck the automaker calls bigger, stronger and smarter than the model it replaces with increased trailering capabilities. The Sierra 2500HD comes on the heels of new light-duty models of the Sierra and Chevrolet Silverado, which have been arriving on U.S. dealer lots since the fourth quarter of last year. A new Chevy Silverado 2500HD will be shown publicly next month. Under the hood of the new Sierra 2500HD is a familiar, but thoroughly updated, Duramax 6.6L turbodiesel V-8 making an SAE-certified 445 hp and 910 lb.-ft. (1,234 Nm) of torque. The torque number falls short of the 1,000 lb.-ft. (1,356 Nm) from the new Ram 2500 and 3500 with its Cummins 6.7L inline 6-cyl. High Output Turbodiesel unveiled at last week’s Detroit auto show to a chorus of chest thumping. Jaclyn McQuaid, chief engineer-heavy duty trucks at GM, acknowledges the big torque number from the Ram but says the Sierra 2500HD’s Duramax turbodiesel and a segment first, all-new Allison 10-speed automatic transmission will combine for a towing capacity of more than 30,000 lbs. (13,608 kg) and more capability than most owners will ever need. The Allison transmission reportedly uses close gear spacing to permit operation in an optimal range despite varying loads and terrain. “What we have is an engine in combination with an Allison transmission to give our customers what they want,” McQuaid tells Wards on the sidelines of the truck’s debut here. “Our goal was to give our customers what they want, rather than a big number. GM says additional powertrain details, such as trailering capacities and information around an all-new gasoline engine for the truck, will come shortly. As profitable as its light-duty sibling might be, the Sierra 2500HD sends even more cash on average into GM’s coffers with 90% of its buyers choosing the more expensive crew-cab model and 55% going for the Denali luxury trim package. “So as you can imagine, the average transaction price paid is very, very good,” says Duncan Aldred, vice president-Global GMC. Key technological improvements to the Duramax turbodiesel include increased cooling capacity thanks in part to improved air induction, the automaker says. A dual-path intake system draws dense, cool air through a prominent hood scoop and larger front grille, GM says. 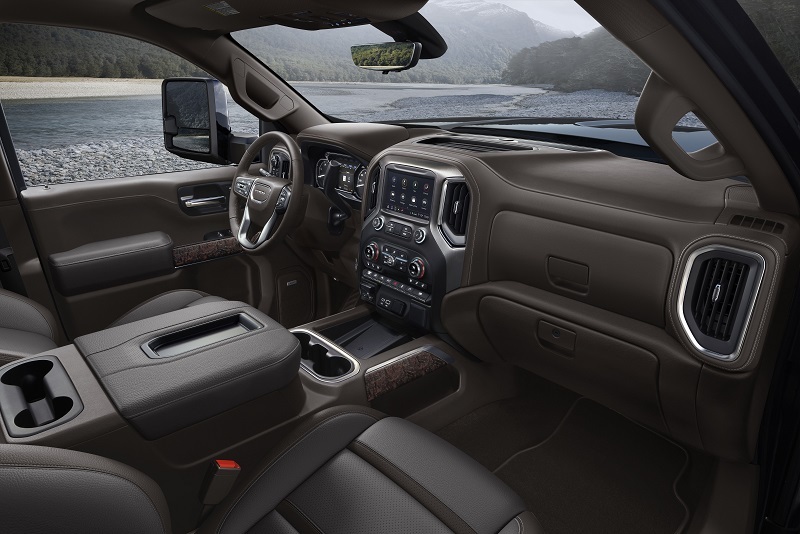 2020 GMC Sierra Denali 2500HD interior. Sierra 2500HD customers lead a trailering lifestyle, whether for work or play, so GM sought to offer them an unparalleled package of pulling technologies. For example, the ProGrade Trailering System that bowed on the light-duty model has been enhanced for the Sierra 2500HD with 15 camera views, including an industry-first transparent-trailering view combining a tailgate-mounted camera with an accessory camera to see through compatible trailers for more easily navigating parking lots, merging into traffic or making a turn. Owners also will have the capability to link their Sierra 2500HD to compatible smartphones to control several trailer functions from the palm of their hands, while an available in-dash trailering app helps keep track of key trailering diagnostics for added safety. Other key items to enhance the trailering experience include an automatic electric parking brake to help maintain the truck’s position when hitching, and an all-new hill-hold system using braking effort at each wheel for an extended period. Larger, door-mounted and powered trailering mirrors with a four-bar link extend and retract at the driver and passenger sides. recall a specified trailer’s most recent gain setting, while tow-haul mode will remain engaged on the next key-on cycle, for up to four hours with a reminder the feature is engaged, to enhance convenience. The Sierra 2500HD also adds hill-start assist and hill-descent control; trailer sway control, automatic grade braking and diesel-exhaust braking; a digital variable steering assist to dynamically optimize power steering according to driving scenarios, including trailering, and enables features like road pull compensation. Like the Sierra 1500, the Sierra 2500HD includes trailering information on the driver-door jamb listing specific trailering information, including curb weight, GVWR, GCWR, maximum payload, maximum tongue weight and rear GAWR. Dealers will begin receiving the Sierra 2500HD, as well as a 3500HD in single- and dual-rear- wheel configurations, later this year. Pricing will be revealed closer to its on-sale date.